Living Earth School of Herbalism offers general interest, industry-related and professional lectures, courses and programs. All Living Earth courses and programs are recognized by the Ontario Herbalists Association and by Employment and Social Development Canada. These lectures are open to anyone who is interested! 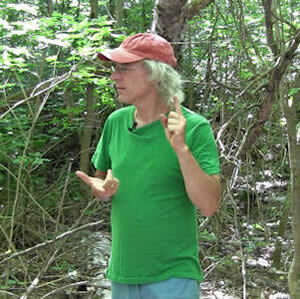 They are based on the popular weekly lecture series that Michael Vertolli offered a number of years ago when Living Earth School was located in Toronto. Each lecture is on a single topic. You may view it as a streamed video file. An alternative audio file is also available if you do not have efficient high-speed internet access or wish to listen to them in an environment where viewing a video is not appropriate. For each lecture you will be provided with a PDF handout with supplementary information. There is also a forum from which you can ask questions on the lecture content as well as have access to the answers to questions from other students. You may view the FREE Introductory Lecture in which Michael Vertolli introduces the Lecture Series and provides some general information about health and healing. Anyone who is interested may enroll in any of our online courses as well as the Herbal Field Studies, Medicine Making and The Spirit of Herbs workshops. As a general interest student your are not required to enroll in a certificate or diploma program. You may take as many workshops and courses as you wish. The Holistic Herbal Studies program is recommended for anyone who would like a general introduction to herbalism and natural healing. This program will provide you with practical knowledge that you may use for your own personal benefit as well as to help your family and friends. It is also recommended if you wish to complement another field of study or if you work with herbs and natural health products and require sound knowledge of their properties and application, such as if you are an employee of a natural food and supplements store, or a manufacturer or distributor of herbs and other natural health products. This program is intended for anyone who has a passion for herbs and healing and wishes to pursue a career as a clinical holistic herbalist! It is based on Four Elements Herbal Therapy, a unique system of Western herbalism developed by Michael Vertolli which draws upon North American and European roots. Although the materia medica is primarily based on herbs that are native to or naturalized in eastern North America, once understood you can apply this system using herbs from any region of the world. Living Earth School of Herbalism provides quality education in Western herbalism and related subjects for those who wish to learn more for their own personal benefit, or who wish to pursue a career in this field. Living Earth offers workshops and online courses for the general public as well as professional training for herbalists, other practitioners, and employees of the herbal and natural health products industry.